A.H. Frey. “Human auditory system response to modulated electromagnetic energy.” J Applied Physiol 17 (4): 689-92, 1962. A.H. Frey. “Behavioral Biophysics” Psychol Bull 63(5): 322-37, 1965. F.A. Giori and A.R. Winterberger. “Remote Physiological Monitoring Using a Microwave Interferometer”, Biomed Sci Instr 3: 291-307, 1967. A.H. Frey and R. Messenger. “Human Perception of Illumination with Pulsed Ultrahigh-Frequency Electromagnetic Energy”, Science 181: 356-8, 1973. R. Rodwell. “Army tests new riot weapon”, New Scientist Sept. 20, p 684, 1973. A.W. Guy, C.K. Chou, J.C. Lin, and D. Christensen. “Microwave induced acoustic effects in mammalian auditory systems and physical materials”, Annals of New York Academy of Sciences, 247:194-218, 1975. D.R. Justesen. “Microwaves and Behavior”, Am Psychologist, 392(Mar): 391-401, 1975. S.M. Michaelson. “Sensation and Perception of Microwave Energy”, In: S.M. Michaelson, M.W. Miller, R. Magin, and E.L. Carstensen (eds. ), Fundamental and Applied Aspects of Nonionizing Radiation. Plenum Press, New York, p 213-24, 1975. E.S. Eichert and A.H. Frey. “Human Auditory System Response to Lower Power Density Pulse Modulated Electromagnetic Energy: A Search for Mechanisms”, J Microwave Power 11(2): 141, 1976. W. Bise. “Low power radio-frequency and microwave effects on human electroencephalogram and behavior”, Physiol Chem Phys 10(5): 387-98, 1978. J.C. Lin. “Microwave Auditory Effects and Applications”, Thomas, Springfield Ill, p 176, 1978. P.L. Stocklin and B.F. Stocklin. “Possible Microwave Mechanisms of the Mammalian Nervous System”, T-I-T J Life Sci 9: 29-51, 1979. H. Frolich. “The Biological Effects of Microwaves and Related Questions”, Adv Electronics Electron Physics 53: 85-152, 1980. R.C. Beason and P. Semm. “Responses of neurons to an amplitude modulated microwave stimulus”, Neurosci Lett 333: 175-78, 2002. J.A. Elder and C.K. Chou. “Auditory Responses to Pulsed Radiofrequency Energy”, Bioelectromagnetics Suppl 8: S162-73, 2003. Lin, J.C., 1980, “The microwave auditory phenomenon”, Proceedings of the IEEE, 68:67-73. Navy-NSF-supported research. Lin, JC., “Microwave auditory effect- a comparison of some possible transduction mechanisms“. J Microwave Power. 1976 Mar;11(1):77-81. 1976. Fist, Stewart, “Australian exposure standards“. Crossroads, The Australian, March 1999. Malech, Robert G., “US3951134 : Apparatus and method for remotely monitoring and altering brain waves”. April 20, 1976. McMurtrey, John J., “Inner Voice, Target Tracking, and Behavioral Influence Technologies” (PDF file Download 14965.pdf). Nov. 14, 2004. McMurtrey JJ. “ “Microwave Bioeffect Congruence with Schizophrenia Download microwave_congruence_schizophrenia.pdf In press, 2003. Air Force official says nonlethal weapons should be used on people in crowd-control situations. Nonlethal weapons such as high-power microwave devices should be used on American citizens in crowd-control situations before they are used on the battlefield, the Air Force secretary said Tuesday. The Air Force has funded research into nonlethal weapons, but he said the service isn’t likely to spend more money on development until injury issues are reviewed by medical experts and resolved. On another subject, Wynne said he expects to pick a new contractor for the next generation aerial refueling tanking by next summer. He said a draft request for bids will be put out next month, and there are two qualified bidders: The Boeing Co. and a team of Northrop Grumman Corp. and European Aeronautic Defence and Space Co., the majority owner of European jet maker Airbus SAS. The contract is expected to be worth at least $20 billion. Chicago-based Boeing lost the tanker deal in 2004 amid revelations that it had hired a top Air Force acquisitions official who had given the company preferential treatment. Wynne also said the Air Force, which is already chopping 40,000 active duty, civilian and reserves jobs, is now struggling to find new ways to slash about $1.8 billion from its budget to cover costs from the latest round of base closings. He said he can’t cut more people, and it would not be wise to take funding from military programs that are needed to protect the country. But, he said he also encounters resistance when he tries to save money on operations and maintenance by retiring aging aircraft. We’re finding out that those are, unfortunately, prized possessions of some congressional districts,” said Wynne, adding that the Air Force will have to “take some appetite suppressant pills,” he said. He said he has asked employees to look for efficiencies in their offices. The base closings initially were expected to create savings by reducing Air Force infrastructure by 24 percent. resonant frequency are consistent with transmission through the channels. Thus, the channels are the most likely pathway for transmission of sound to the inner ear in microwave hearing. Consideration of this transmission pathway may be useful in reconciling results from various microwave hearing experiments. components within the temporal bone. The figure is adapted from images created by Alec N. Salt, Washington University [http://oto.wustl.edu/cochlea/intro1.htm]. Fig. 2 emphasizes acoustic pathways in a schematic diagram of the inner ear and nearby tissues. The cochlear aqueduct connection with the cochlea is much closer to the middle ear than depicted in this figure. Cranial contents are represented by brain tissue and cerebral spinal fluid (CSF) in Fig. 2. Distance between CSF and the temporal bone is exaggerated in both figures for clarity. The most likely mechanism for transduction of a pulse of microwave energy to sound in tissue is thermoelastic expansion during the pulse [1-3,5-7]. Mathematical models of thermoelastic expansion in spherical heads having the dielectric properties of brain tissue predict that the generated sound has a fundamental resonant frequency determined only by head size [3,6]. Characteristics of sound measured in spherical tissue models and animal heads of different sizes are consistent with the prediction [7-9]. In addition, the round- window cochlear microphonic, which represents the acoustic waveform in the cochlea, recorded in animals in response to a microwave pulse oscillates near the calculated resonant frequency for the head being exposed [2,3,10,11]. Figure 1. A diagram of the mammalian inner ear. external meatus is blocked. Because microwave hearing literature sites work on bone-conduction hearing tested with a bone stimulator , a pathway through bone of the type represented by the solid arrow from the bone stimulator and to the cochlea in Fig. 2 was probably intended. Of course, when the source of sound is inside the cranium, the pathway through bone originates at the interior surface of temporal bone rather than the exterior. An additional pathway for sound transmission to the inner ear by bone conduction has recently been discovered in experiments on rodents and humans [14,16]. This pathway is not through bone tissue itself but through channels that connect cranial contents with the inner ear. This pathway is shown in Fig. 2 as a curved Figure 2. Sound pathways in air- and bone-conduction hearing. arrow originating near the bone stimulator, passing as two branches (one partially obscured) into cranial contents, and then through channels in the bone into the inner ear. The channels likely contributing most to transmission in this pathway are the vestibular and cochlear aqueducts, as shown Fig. 2. Channels through which nerves and blood vessels travel provide additional possible paths for sound transmission in parallel with the aqueducts. Together these channnels constitute a “non-osseous” pathway that accounts for most of the sound transmitted to the cochlea in bone-conduction hearing [14,16]. very little is transmitted into bone (dashed curved arrow). At least two observations in microwave hearing research provide support for the proposed direct pathway for sound transmission. One is the correspondence between the frequency of cochlear microphonic oscillations and the calculated resonant frequency of the brain [2,3,11]. If sound generated intracranially were to couple to bones of the skull we would expect resonant vibration of the skull to be reflected in the cochlear microphonic. The resonant frequency of the adult human skull is 1-2 kHz [18-20]. This is about one-tenth of the predicted brain resonant frequency of 11 kHz for microwave hearing in adults . In the absence of data on animal skulls, we might expect a similar ratio between resonant frequencies of brain and skull for other mammals. However, only the higher frequency of brain resonance is observed in cochlear microphonic oscillations. Lack of skull vibration is consistent with vibration not being detected with exposure to microwave pulses . Based on a number of considerations, we can reasonably conclude that the pathway for transmission of sound from intracranial tissues to the inner ear in microwave hearing is through various channels in bone that connect to the intracranial space to the inner ear. This pathway appears to dominate over other pathways in bone-conduction hearing and can be driven by bone-conducted sound, but the pathway through bone does not require that sound actually travel in the bone itself. The previously proposed pathway for sound transmission to the cochlea in microwave hearing that includes bone vibration is most likely not the pathway. This observation should be useful in reconciling results from various experiments on microwave hearing. Results from future microwave hearing experiments to test for non-osseous bone conduction can be considered in setting exposure limits for microwave pulses. This work is supported by U.S. Army Medical Research and Materiel Command contract DAMD17-94-C- 4069 awarded to McKesson BioServices Corporation. The views, opinions and/or findings contained in this report are those of the author(s) and should not be construed as an official Department of the Army position, policy or decision unless so designated by other documentation. This article is a US Government work and, as such, is in the public domain in the United States of America. WRAIR is the Walter Reed Army Institute of Research in Washington, DC USA. The author is grateful to Dr. Clifford Sherry for various stimulating discussions on microwave hearing topics. Lin JC. 1980. The microwave auditory phenomenon. Proc IEEE 68(1):67-73.
fields. J Acoust Soc Am 71(6):1321-1334. Effects and Medical Applications of Electromagnetic Fields. New York: Prentice-Hall, pp 277-318. Lin JC. 1978. Microwave Auditory Effects and Applications. Springfield,Illinois: Charles C. Thomas. Olsen RG, Lin JC. 1981. Microwave pulse-induced acoustic resonances in spherical head models. IEEE Trans Microwave Theory and Tech 29(10):1114-1117.
microwave pulses. J Microwave Power 10(4):361-367.
microwaves. J Microwave Power 14(4):321-326. Tonndorf J. 1972. Bone conduction. In Tobias JV (ed): Foundations of Modern Auditory Theory. New York: Academic Press, pp 197-237.
non-osseous mechanism. Hear Res 146(1-2):72-80.
humans: A fluid pathway from bone to ear. Hear Res 146(1-2):81-88.
with and without skin penetration. J Acoust Soc Am 80(4):1065-1075.
vitro. J Acoust Soc Am 107(1):422-431.
bone-conducted stimuli. Hear Res 160(1-2):111-113.
measurements. J Am Acad Audiol 4(3):213-219. This is the html version of the file http://www.beperkdestraling.org/Studies%20en%20Rapporten/Tinnitus/Microwave%20Hearing%20Pathway.pdf. BERKELEY, Calif., Dec. 27 — Scientists must start thinking now about the possibilities of mind control that their research may soon make possible, the chairman of a symposium on the brain said today. Girard’s description of himself is matter-of-fact, until he explains what’s in the bag: documents he believes prove that the government is attempting to control his mind. He carries that black, weathered bag everywhere he goes. “Every time I go out, I’m prepared to come home and find everything is stolen,” he says. The bag aside, Girard appears intelligent and coherent. At a table in front of Dunkin’ Donuts inside the train station, Girard opens the bag and pulls out a thick stack of documents, carefully labeled and sorted with yellow sticky notes bearing neat block print. The documents are an authentic-looking mix of news stories, articles culled from military journals and even some declassified national security documents that do seem to show that the U.S. government has attempted to develop weapons that send voices into people’s heads. The thing that’s missing from his bag — the lack of which makes it hard to prove he isn’t crazy — is even a single document that would buttress the implausible notion that the government is currently targeting a large group of American citizens with mind-control technology. The only direct evidence for that, Girard admits, lies with alleged victims such as himself. IT’S 9:01 P.M. WHEN THE FIRST PERSON SPEAKS during the Saturday conference call. Unsure whether anyone else is on the line yet, the female caller throws out the first question: “You got gang stalking or V2K?” she asks no one in particular. There’s a short, uncomfortable pause. “V2K, really bad. 24-7,” a man replies. “Gang stalking,” another woman says. “Oh, yeah, join the club,” yet another man replies. The members of this confessional “club” are not your usual victims. This isn’t a group for alcoholics, drug addicts or survivors of childhood abuse; the people connecting on the call are self-described victims of mind control — people who believe they have been targeted by a secret government program that tracks them around the clock, using technology to probe and control their minds. The callers frequently refer to themselves as TIs, which is short for Targeted Individuals, and talk about V2K — the official military abbreviation stands for “voice to skull” and denotes weapons that beam voices or sounds into the head. In their esoteric lexicon, “gang stalking” refers to the belief that they are being followed and harassed: by neighbors, strangers or colleagues who are agents for the government. A few more “hellos” are exchanged, interrupted by beeps signaling late arrivals: Bill from Columbus, Barbara from Philadelphia, Jim from California and a dozen or so others. But during the Saturday conference call, the subject of aluminum foil is deadly serious. The MIT study had prompted renewed debate; while a few TIs realized it was a joke at their expense, some saw the findings as an explanation for why tinfoil didn’t seem to stop the voices. Others vouched for the material. “Tinfoil helps tremendously,” reports one conference call participant, who describes wrapping it around her body underneath her clothing. “Where do you put the tinfoil?” a man asks. For all the scorn, the ranks of victims — or people who believe they are victims — are speaking up. In the course of the evening, there are as many as 40 clicks from people joining the call, and much larger numbers participate in the online forum, which has 143 members. A note there mentioning interest from a journalist prompted more than 200 e-mail responses. The biggest hurdle for TIs is getting people to take their concerns seriously. A proposal made in 2001 by Rep. Dennis Kucinich (D-Ohio) to ban “psychotronic weapons” (another common term for mind-control technology) was hailed by TIs as a great step forward. But the bill was widely derided by bloggers and columnists and quickly dropped. Doug Gordon, Kucinich’s spokesman, would not discuss mind control other than to say the proposal was part of broader legislation outlawing weapons in space. The bill was later reintroduced, minus the mind control. “It was not the concentration of the legislation, which is why it was tightened up and redrafted,” was all Gordon would say. Girard sought advice from this then-girlfriend, a practicing psychologist, whom he declines to identify. He says she told him, “Nobody can become psychotic in their late 40s.” She said he didn’t seem to manifest other symptoms of psychotic behavior — he dressed well, paid his bills — and, besides his claims of surveillance, which sounded paranoid, he behaved normally. “People who are psychotic are socially isolated,” he recalls her saying. After a few months, Girard says, the harassment abruptly stopped. But the respite didn’t last. In 1984, appropriately enough, things got seriously weird. He’d left his real estate career to return to school at the University of Pennsylvania, where he was studying for a master’s degree in landscape architecture. He harbored dreams of designing parks and public spaces. Then, he says, he began to hear voices. Girard could distinguish several different male voices, which came complete with a mental image of how the voices were being generated: from a recording studio, with “four slops sitting around a card table drinking beer,” he says. Six months after the voices began, they had another question for him: “Mr. Girard, Mr. Girard. Why aren’t you dead yet?” At first, he recalls, the voices would speak just two or three times a day, but it escalated into a near-constant cacophony, often accompanied by severe pain all over his body — which Girard now attributes to directed-energy weapons that can shoot invisible beams. “Finally, I said: ‘Look, I must come to the point, because I need answers. This is happening to me; it’s not science fiction. '” They laughed. What he was finding on his research trips also buttressed his belief: Girard learned that in the 1950s, the CIA had drugged unwitting victims with LSD as part of a rogue mind-control experiment called MK-ULTRA. He came across references to the CIA seeking to influence the mind with electromagnetic fields. Then he found references in an academic research book to work that military researchers at Walter Reed Army Institute of Research had done in the 1970s with pulsed microwaves to transmit words that a subject would hear in his head. Elsewhere, he came across references to attempts to use electromagnetic energy, sound waves or microwave beams to cause non-lethal pain to the body. For every symptom he experienced, he believed he found references to a weapon that could cause it. Concerns about microwaves and mind control date to the 1960s, when the U.S. government discovered that its embassy in Moscow was being bombarded by low-level electromagnetic radiation. In 1965, according to declassified Defense Department documents, the Pentagon, at the behest of the White House, launched Project Pandora, top-secret research to explore the behavioral and biological effects of low-level microwaves. For approximately four years, the Pentagon conducted secret research: zapping monkeys; exposing unwitting sailors to microwave radiation; and conducting a host of other unusual experiments (a sub-project of Project Pandora was titled Project Bizarre). The results were mixed, and the program was plagued by disagreements and scientific squabbles. The “Moscow signal,” as it was called, was eventually attributed to eavesdropping, not mind control, and Pandora ended in 1970. And with it, the military’s research into so-called non-thermal microwave effects seemed to die out, at least in the unclassified realm. But there are hints of ongoing research: An academic paper written for the Air Force in the mid-1990s mentions the idea of a weapon that would use sound waves to send words into a person’s head. “The signal can be a ‘message from God’ that can warn the enemy of impending doom, or encourage the enemy to surrender,” the author concluded. In 2002, the Air Force Research Laboratory patented precisely such a technology: using microwaves to send words into someone’s head. That work is frequently cited on mind-control Web sites. Rich Garcia, a spokesman for the research laboratory’s directed energy directorate, declined to discuss that patent or current or related research in the field, citing the lab’s policy not to comment on its microwave work. In response to a Freedom of Information Act request filed for this article, the Air Force released unclassified documents surrounding that 2002 patent — records that note that the patent was based on human experimentation in October 1994 at the Air Force lab, where scientists were able to transmit phrases into the heads of human subjects, albeit with marginal intelligibility. Research appeared to continue at least through 2002. Where this work has gone since is unclear — the research laboratory, citing classification, refused to discuss it or release other materials. “That work is exceedingly sensitive” and unlikely to be reported in any unclassified documents, he says. Meanwhile, the military’s use of weapons that employ electromagnetic radiation to create pain is well-known, as are some of the limitations of such weapons. In 2001, the Pentagon declassified one element of this research: the Active Denial System, a weapon that uses electromagnetic radiation to heat skin and create an intense burning sensation. So, yes, there is technology designed to beam painful invisible rays at humans, but the weapon seems to fall far short of what could account for many of the TIs’ symptoms. While its exact range is classified, Doug Beason, an expert in directed-energy weapons, puts it at about 700 meters, and the beam cannot penetrate a number of materials, such as aluminum. Considering the size of the full-scale weapon, which resembles a satellite dish, and its operational limitations, the ability of the government or anyone else to shoot beams at hundreds of people — on city streets, into their homes and while they travel in cars and planes — is beyond improbable. But, given the history of America’s clandestine research, it’s reasonable to assume that if the defense establishment could develop mind-control or long-distance ray weapons, it almost certainly would. And, once developed, the possibility that they might be tested on innocent civilians could not be categorically dismissed. What would the government gain by torturing him? Again, Girard found what he believed to be an explanation, or at least a precedent: During the Cold War, the government conducted radiation experiments on scores of unwitting victims, essentially using them as human guinea pigs. Girard came to believe that he, too, was a walking experiment. Both male and female TIs report a variety of “attacks” to their sexual organs. “My testicles became so sore I could barely walk,” Girard says of his early experiences. Others, however, report the attacks in the form of sexual stimulation, including one TI who claims he dropped out of the seminary after constant sexual stimulation by directed-energy weapons. Susan Sayler, a TI in San Diego, says many women among the TIs suffer from attacks to their sexual organs but are often embarrassed to talk about it with outsiders. But in 2005, she published a lesser-known work, 1996, a semi-autobiographical book describing her experience as a TI. “I didn’t want to tell this story. It’s going to take courage. Perhaps more courage than I possess, but they’ve left me no alternatives,” Naylor writes at the beginning of her book. “I am in a battle for my mind. If I stop now, they’ll have won, and I will lose myself.” The book is coherent, if hard to believe. It’s also marked by disturbing passages describing how Jewish American agents were responsible for Naylor’s surveillance. “Of the many cars that kept coming and going down my road, most were driven by Jews,” she writes in the book. When asked about that passage in a recent interview, she defended her logic: Being from New York, she claimed, she can recognize Jews. Like Girard, Naylor describes what she calls “street theater” — incidents that might be dismissed by others as coincidental, but which Naylor believes were set up. She noticed suspicious cars driving by her isolated vacation home. On an airplane, fellow passengers mimicked her every movement — like mimes on a street. Voices similar to those in Girard’s case followed — taunting voices cursing her, telling her she was stupid, that she couldn’t write. Expletive-laced language filled her head. Naylor sought help from a psychiatrist and received a prescription for an antipsychotic drug. But the medication failed to stop the voices, she says, which only added to her conviction that the harassment was real. Naylor is not the first writer to describe such a personal descent. Evelyn Waugh, one of the great novelists of the 20th century, details similar experiences in The Ordeal of Gilbert Pinfold. Waugh’s book, published in 1957, has eerie similarities to Naylor’s. Embarking on a recuperative cruise, Pinfold begins to hear voices on the ship that he believes are part of a wireless system capable of broadcasting into his head; he believes the instigator recruited fellow passengers to act as operatives; and he describes “performances” put on by passengers directed at him yet meant to look innocuous to others. Naylor, who hasn’t written a book since 1996, is now back at work on an historical novel she hopes will return her to the literary mainstream. She remains convinced that she was targeted by mind control. The many echoes of her ordeal she sees on the mind-control forums reassure her she’s not crazy, she says. SOME TIS, SUCH AS ED MOORE, A YOUNG MEDICAL DOCTOR, take a slightly more skeptical approach. He criticizes what he calls the “wacky claims” of TIs who blame various government agencies or groups of people without any proof. “I have yet to see a claim of who is behind this that has any data to support it,” he writes. Nonetheless, Moore still believes the voices in his head are the result of mind control and that the U.S. government is the most likely culprit. Moore started hearing voices in 2003, just as he completed his medical residency in anesthesiology; he was pulling an all-nighter studying for board exams when he heard voices coming from a nearby house commenting on him, on his abilities as a doctor, on his sanity. At first, he thought he was simply overhearing conversations through walls (much as Waugh’s fictional alter ego first thought), but when no one else could hear the voices, he realized they were in his head. Moore went through a traumatic two years, including hospitalization for depression with auditory hallucinations. He says he grew frustrated with anti-psychotic medications meant to stop the voices, both because the treatments didn’t work and because psychiatrists showed no interest in what the voices were telling him. He began to look for some other way to cope. “In March of 2005, I started looking up support groups on the Internet,” he wrote. “My wife would cry when she would see these sites, knowing I still heard voices, but I did not know what else to do.” In 2006, he says, his wife, who had stood by him for three years, filed for divorce. Moore, like other TIs, is cautious about sharing details of his life. He worries about looking foolish to friends and colleagues — but he says that risk is ultimately worthwhile if he can bring attention to the issue. With his father’s financial help, Moore is now studying for an electrical engineering degree at the University of Texas at San Antonio, hoping to prove that V2K, the technology to send voices into people’s heads, is real. Being in school, around other people, helps him cope, he writes, but the voices continue to taunt him. A WEEK BEFORE THE TIS RALLY ON THE NATIONAL MALL, John Alexander, one of the people whom Harlan Girard holds personally responsible for the voices in his head, is at a Chili’s restaurant in Crystal City explaining over a Philly cheese steak and fries why the United States needs mind-control weapons. A former Green Beret who served in Vietnam, Alexander went on to a number of national security jobs, and rubbed shoulders with prominent military and political leaders. Long known for taking an interest in exotic weapons, his 1980 article, “The New Mental Battlefield,” published in the Army journal Military Review, is cited by self-described victims as proof of his complicity in mind control. Now retired from the government and living in Las Vegas, Alexander continues to advise the military. He is in the Washington area that day for an official meeting. Beneath a shock of white hair is the mind of a self-styled military thinker. Alexander belongs to a particular set of Pentagon advisers who consider themselves defense intellectuals, focusing on big-picture issues, future threats and new capabilities. Alexander’s career led him from work on sticky foam that would stop an enemy in his or her tracks to dalliances in paranormal studies and psychics, which he still defends as operationally useful. According to Alexander, the military and intelligence agencies were still scared by the excesses of MK-ULTRA, the infamous CIA program that involved, in part, slipping LSD to unsuspecting victims. “Until recently, anything that smacked of [mind control] was extremely dangerous” because Congress would simply take the money away, he said. But September 11, 2001, changed the mood in Washington, and some in the national security community are again expressing interest in mind control, particularly a younger generation of officials who weren’t around for MK-ULTRA. “It’s interesting, that it’s coming back,” Alexander observed. While Alexander scoffs at the notion that he is somehow part of an elaborate plot to control people’s minds, he acknowledges support for learning how to tap into a potential enemy’s brain. He gives as an example the possible use of functional magnetic resonance imaging, or fMRI, for lie detection. “Brain mapping” with fMRI theoretically could allow interrogators to know when someone is lying by watching for activity in particular parts of the brain. For interrogating terrorists, fMRI could come in handy, Alexander suggests. But any conceivable use of the technique would fall far short of the kind of mind-reading TIs complain about. Alexander also is intrigued by the possibility of using electronic means to modify behavior. The dilemma of the war on terrorism, he notes, is that it never ends. So what do you do with enemies, such as those at Guantanamo: keep them there forever? That’s impractical. Behavior modification could be an alternative, he says. When Alexander encounters a query he doesn’t want to answer, such as one about the ethics of mind control, he smiles and raises his hands level to his chest, as if balancing two imaginary weights. In one hand is mind control and the sanctity of free thought — and in the other hand, a tad higher — is the war on terrorism. In her book, Abducted, Harvard psychologist Susan Clancy examines a group that has striking parallels to the TIs: people who believe they’ve been kidnapped by aliens. The similarities are often uncanny: Would-be abductees describe strange pains, and feelings of being watched or targeted. And although the alleged abductees don’t generally have auditory hallucinations, they do sometimes believe that their thoughts are controlled by aliens, or that they’ve been implanted with advanced technology. Clancy argues that the main reason people believe they’ve been abducted by aliens is that it provides them with a compelling narrative to explain their perception that strange things have happened to them, such as marks on their bodies (marks others would simply dismiss as bruises), stimulation to their sexual organs (as the TIs describe) or feelings of paranoia. “It’s not just an explanation for your problems; it’s a source of meaning for your life,” Clancy says. BACK AT THE PHILADELPHIA TRAIN STATION, Girard seems more agitated. In a meeting the week before, his “handlers” had spoken to him only briefly — they weren’t in the right position to attack him, Girard surmises, based on the lack of voices. Today, his conversation jumps more rapidly from one subject to the next: victims of radiation experiments, his hatred of George H.W. Bush, MK-ULTRA, his personal experiences. The week before, Girard had pointed to only one person who appeared suspicious to him — a young African American man reading a book; this time, however, he hears more voices, which leads him to believe the station is crawling with agents. Yet many parts of Girard’s life seem to reflect that of any affluent 70-year-old bachelor. He travels frequently to France for extended vacations and takes part in French cultural activities in Philadelphia. He has set up a travel scholarship at the Cleveland Institute of Art in the name of his late mother, who attended school there (he changed his last name 27 years ago for “personal reasons”), and he travels to meet the students who benefit from the fund. And while the bulk of his time is spent on his research and writing about mind control, he has other interests. He follows politics and describes outings with friends and family members with whom he doesn’t talk about mind control, knowing they would view it skeptically. IT LOOKS ALMOST LIKE ANY OTHER SMALL POLITICAL RALLY IN WASHINGTON. Posters adorn the gate on the southwest side of the Capitol Reflecting Pool, as attendees set up a table with press materials, while volunteers test a loudspeaker and set out coolers filled with bottled water. The sun is out, the weather is perfect, and an eclectic collection of people from across the country has gathered to protest mind control. About 35 TIs show up for the June rally, in addition to a few friends and family members. Speakers alternate between giving personal testimonials and descriptions of research into mind-control technology. Most of the gawkers at the rally are foreign tourists. A few hecklers snicker at the signs, but mostly people are either confused or indifferent. The articles on mind control at the table — from mainstream news magazines — go untouched. “How can you expect people to get worked up over this if they don’t care about eavesdropping or eminent domain?” one man challenges after stopping to flip through the literature. Mary Ann Stratton, who is manning the table, merely shrugs and smiles sadly. There is no answer: Everyone at the rally acknowledges it is an uphill battle. Several weeks after the rally, Girard shows up for a meeting with a reporter at the stately Mayflower Hotel in Washington, where he has stayed frequently over the two decades he has traveled to the capital to battle mind control. He walks in with a lit cigarette, which he apologetically puts out after a hotel employee tells him smoking isn’t allowed anymore. He is half an hour late — delayed, he says, by a meeting on Capitol Hill. Wearing a monogrammed dress shirt and tie, he looks, as always, serious and professional. Girard declines to mention whom on Capitol Hill he’d met with, other than to say it was a congressional staffer. Embarrassment is likely a factor: Girard readily acknowledges that most people he meets with, ranging from scholars to politicians, ignore his entreaties or dismiss him as a lunatic. Lately, his focus is on his Web site, which he sees as the culmination of nearly a quarter-century of research. When completed, it will contain more than 300 pages of documents. What next? Maybe he’ll move to France (there are victims there, too), or maybe the U.S. government will finally just kill him, he says. Girard suggests that the government, using similar technology, has “catalogued” his life over the past two years — every sight and sound (Evelyn Waugh, in his mind-control book, writes about his character’s similar fear that his harassers were creating a file of his entire life). For all his anguish, be it the result of mental illness or, as Girard contends, government mind control, the voices haven’t managed to conquer the thing that makes him who he is: Call it his consciousness, his intellect or, perhaps, his soul. Sharon Weinberger is a Washington writer and author of Imaginary Weapons: A Journey Through the Pentagon’s Scientific Underworld. She will be fielding questions and comments about this article Tuesday at washingtonpost.com/liveonline. Imagine a weapon that creates sound that only you can hear. Science fiction? No, this is one area that has a very solid basis in reality. The Air Force has experimented with microwaves that create sounds in people’s head (which they’ve called a possible psychological warfare tool), and American Technologies can “beam” sounds to specific targets with their patented HyperSound (and yes, I’ve heard/seen them demonstrate the speakers, and they are shockingly effective). The goal of the Sonic Projector program is to provide Special Forces with a method of surreptitious audio communication at distances over 1 km. Sonic Projector technology is based on the non-linear interaction of sound in air translating an ultrasonic signal into audible sound. 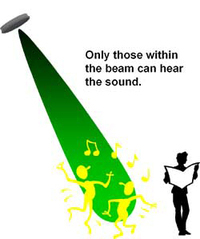 The Sonic Projector will be designed to be a man-deployable system, using high power acoustic transducer technology and signal processing algorithms which result in no, or unintelligible, sound everywhere but at the intended target. The Sonic Projector system could be used to conceal communications for special operations forces and hostage rescue missions, and to disrupt enemy activities. I have worked for 3 years with Microwave and Electronic Harassment victims throughout the US and overseas. It is hard for others to understand the technology that is being used to destroy people’s lives. I know James because he contacted me for help. James has worked to find proof of what has happened to him. Many victims try hard to get help from professional doctors to help find devices such as Veri-Chip. I would request that you and those who can make a difference would help James and others to find answers.